Okey, Dokey, this is another attempt at some vintage, after looking at some other art work, and being influenced by The Funkie Junkie lately, I may be getting closer. I'm not hopping on the sewing machine--yet--I try not to rule things out completely. This week at Tuesday Taggers their sponsor is Crafty Individuals, click on the link and check out a neat site, they've got some great video tutorials and you can add to your stash while you're there. I know if Sue at 52-Card Pickup searches for her new career with exuberance she'll find her nitch. 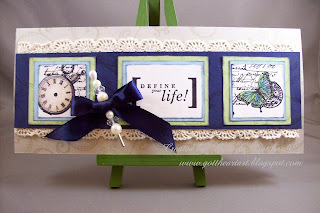 Stamptacular Sunday Challenge Challenge #48: Back In Time! Supplies: Card Blank Made from Sahara Sand 3 3/4" X 8 1/2", Papers: Stampin Up, Stamps: Inkadinkado-91034,CTMH-D1212 Playful Flourishes, Stampin Up-Charming, Define Your Life, Ink: Stampin Up-Night of Navy, Ranger Archival Ink-Jet Black, VersaMark Ink Pad, Stampin Up-Pretties Kit, cousage pin, lace and ribbon-Offray, PrismaColor pencils, gamsol, blending stump, my sentiment computer generated, glue dots. The hat pin and bow are the perfect finishing touches! Thanks so much for playing with us at Stampin' Royalty! You card is gorgeous! Awww - thank you, sweetie! Beautiful card, and so nice of you to think of me! Thanks for playing with us again! STUNNING card - I love it! Just beautiful. Beautiful card so elegant and charming, the blue would never have thought to use it but it is the perfect choice. Thank you for joining us at TT this week, goos luck. Very nice - great use of the colors. Wow, love the eclectic look to this card....just stunning! I'm so glad you could join us this week at the Stamptacular Sunday Challenge! Beautiful card, I love the bow! Love those awesome panels and the wonderful texture of the lace. Wow, Bev, lovely vintage work! I'm thrilled to be an inspiration to you. It's definitely a genre that takes practice so if you like it, just keep working away at it. I had to laugh at your comment that you weren't hopping on the sewing machine because I once remember saying with great conviction that I would never sew on my cards!! 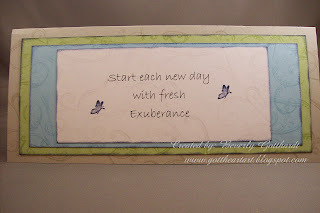 I have a tutorial on making vintage cards that I put together for Sugar Creek Hollow. I'm not sure when they are releasing it - thought it was going to be up there yesterday, but it's not there yet. But watch for it as you may be able to pick up a tip or two. So happy to see that you joined in the fun with pins, lace and pearls with the Creative Inspiration gang this week. http://www.google.com/reader/shared/susanna.boyd?c=CN-p8tvNpaAC. You're the winner on Sweet Sunday Sketch and featured on Card of the Week. Congratulations lady!!!!!! I don't think this could have turned out any better!! Gorgeous colour contrast, beautiful stamp work and embellishments, love it!! Thanks for playing with us at Creative Inspirations this week!! Wow! What a great take on the inspiration picture. I love the colours. Thanks so much for playing with us this week at Stampin’ Royalty!